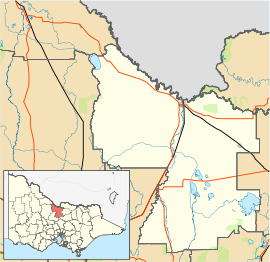 Lockington is a town in northern Victoria, Australia in the Shire of Campaspe local government area, 198 kilometres north of the state capital, Melbourne. At the 2016 census, Lockington had a population of 808. The Post Office opened on 2 May 1876 as Pannoobamawm and was renamed Lockington in 1921. Lockington has one pub, a school, three churches and a small range of shops. The district features an extensive network of irrigation channels and these are said to feature the giant "Loch Ness yabby". Together with its neighbouring township Bamawm, Lockington has an Australian Rules football team (Lockington Bamawm United) competing in the Heathcote District Football League which won consecutive premierships in 2011/2012, led by coach Kahl Oliver. Golfers play at the course of the Lockington Golf Club on Middleton Road. Brad McEwan, former presenter of Sports Tonight and current sports presenter on Ten Eyewitness News Melbourne. Sharelle McMahon, former Melbourne Vixens and Australia netballer. ^ a b "2016 Census QuickStats Lockington". Australian Bureau of Statistics. Retrieved 9 February 2019. ^ O'Kelly, G. J. (1986). "Lockington, William Joseph (1871 - 1948)". Australian Dictionary of Biography, Online Edition. Australian National University. Retrieved 2007-06-03. ^ "LOCKINGTON". Campaspe Shire Council. Retrieved 2007-06-03. ^ Golf Select. "Lockington". Retrieved 2009-05-11. This page was last edited on 17 April 2019, at 00:08 (UTC).